Are you thinking about renovating your bathroom? This article from houzz.com highlights the emerging design trends of 2019. Read on to make sure you are "keeping up with the Jonses'"! Nautical Look with Preppy Touch - White & navy combinations with touches of gold and floors that create that "beachy" feel by simulating natural driftwood tomes. Double Vanities - Two sinks just make good sense in a master bathroom. Personal space for both occupants. Individual framed mirrors over each sink and good lighting finish the look. Polished Industrial Style - Black steel framed showers, elongated subway tiles and hexagonal flooring provide that urban look while the scone lighting and wood accents create a warmer touch. The combination is a real show stopper! 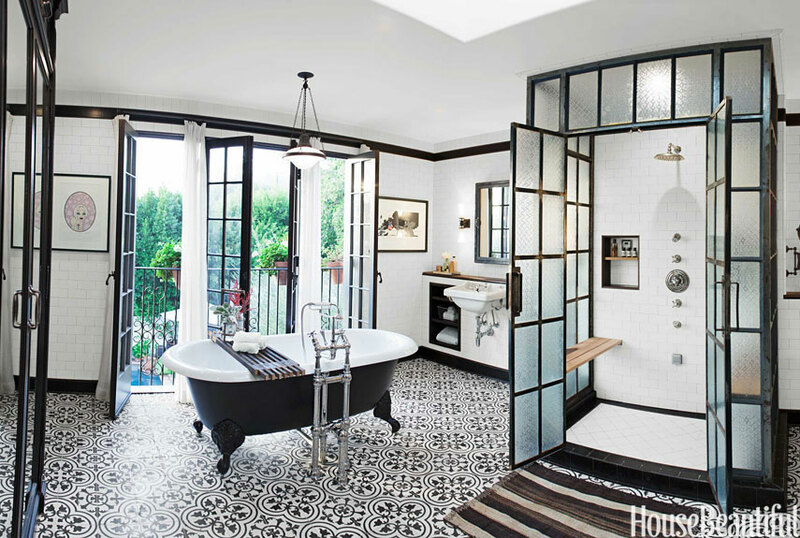 Black & White - A new twist on the traditional black & white bathroom is created by adding in shades of gray and selecting one area to higlight in in different colors o finishes, including special shower tiles, brass fixtures or fun floor tiles. Accessories can also be used to bring in color or patterns. Wood & White - White has been the primary color in bathroom for decades, however pairing it with wood vanities and adding bursts of color with flooring, tile or accessories can create warmth and be a real game changer in the design. Playful Tile - Tile can be the design focal point of your bathroom. Today there are an endless number of tile designs avaialble. Go for a unique pattern or bright color to make a bold statement in your bathroom. Frank's Glass can help you decide which shower enclosure is best for your bathroom. We can also custom cut mirror for your vanity, including installing mirror in your favorite frames. Give us a call at 513.829.8284 to schedule your appointment for a free estimate.